Our resident Superman is adept and capable of tackling nearly any project that needs it. His ability to improvise, adapt, and build our dreams with his strong hands, is just one of the reasons why I love Sean so. There are many. My Superman has his kryptonite, though; it takes form of a simple, utilitarian box cutter. 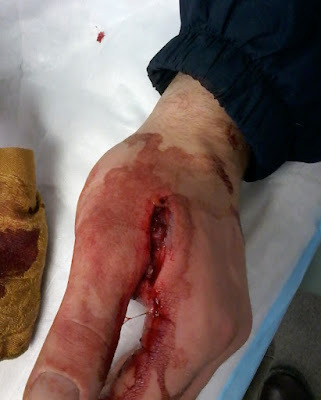 Exhibits A-C: (a) Before Sonja, Sean gouged his side with a box cutter while working at Petco. (b) While cutting a rubber trash can to create a chicken feeder, Sean sliced open his thumb, which is still numb in one area. (c) Sean nicked himself through the years in various box-cutting mishaps. Which brings us to this morning. Sean is really careful using box cutters and open blades, having experienced their wicked help before. He thought to make certain that his appendages were well away from danger. Yet an accident still happened while using a box cutter to remove a sliver of wood from the side of a door, so as to insert the hinges. His hand slipped. His hand slipped with enough force to slice through the fleshy part between his left thumb and forefinger, leaving a gaping, perfectly parted, 2 inch wound- very nearly to the bone. It severed through Sean's skin, protective fat, vein and nicked the muscle within. Blood welled bright red and gushed from it. 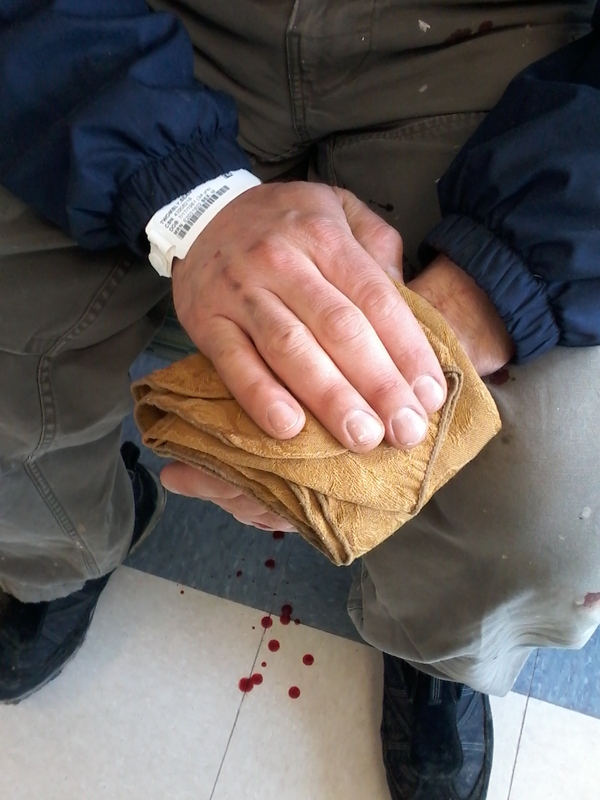 Thinking quickly, Sean clamped his uninjured hand over the injury and pinched together the skin while moving off the family room's carpeted floor- so as to bleed on the more easily cleanable wood floor- and calling for my help. I had been chatting on the phone with a friend, took one look at Sean and the blood running through through his hands and dripping onto his pants and said, "I have to go. Sean's hurt." and hung up the phone. 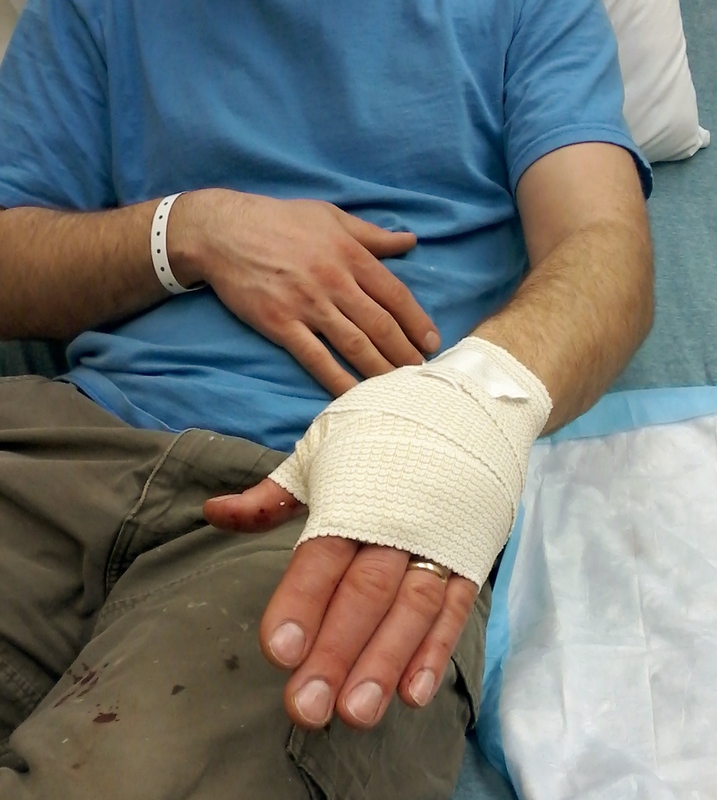 Sean was not going into shock, but he was clearly hurting and the amount of blood running from his hand was ringing alarms in me loud and strong. We are not easily scared by injury. We do most of our own doctoring around here. Step on a nail- clean it, disinfect it and bandage it. 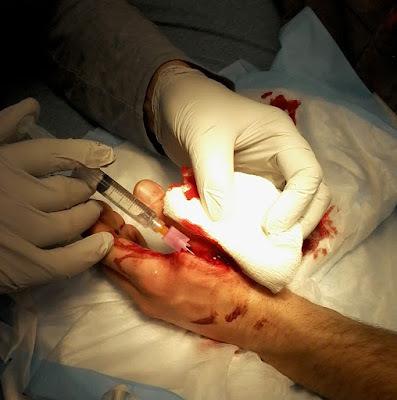 Dislocate a thumb- put it back into place while you have the window of shock to cushion the pain. Slice yourself- clean it, disinfect it, butterfly it if you can. 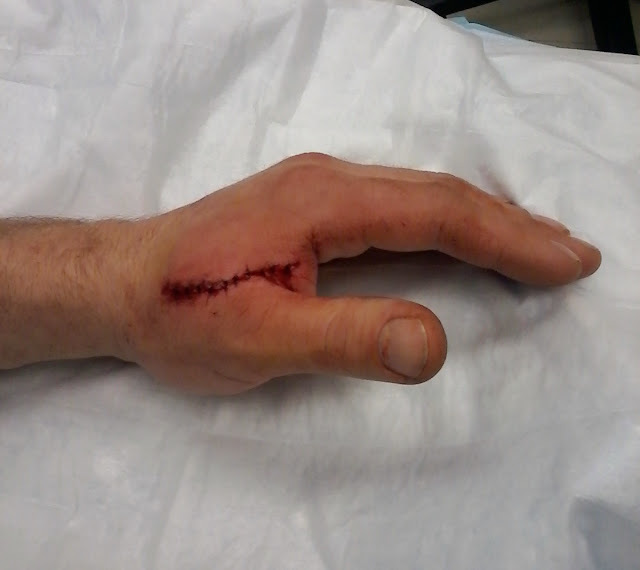 Even without seeing the wound up close, there was NO doubt in my mind that Sean needed help and stitches. I was a little sick at the thought that he might be more gravely injured than that. I grabbed a clean towel and on the count of three had Sean quickly remove the pressure of his hand and push the cloth over the wound. It happened so fast, I couldn't see more than blood, so I still had no idea how bad this was. The nearest hospital is 20 minutes away and we spent the ride there joking to each other to lighten the mood. It was laugh or give in to the fears and worry. 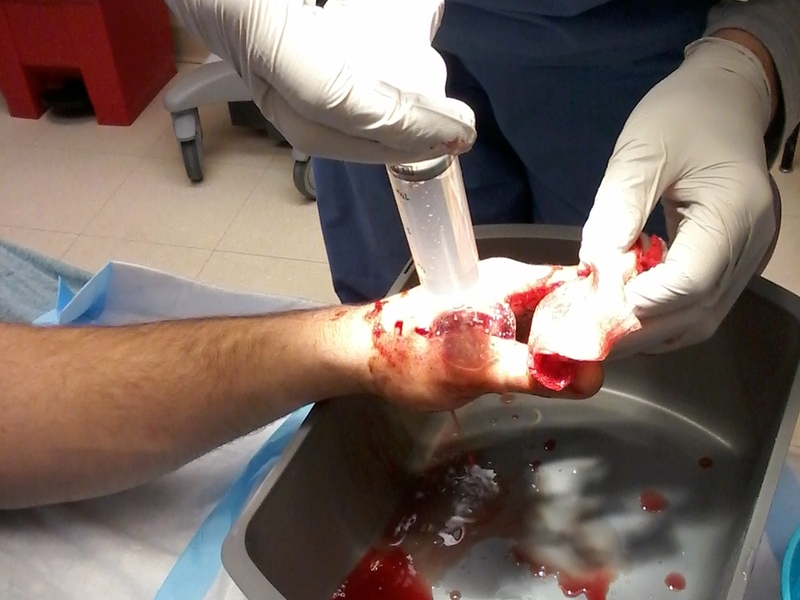 Inside the Waldo County General Hospital ER, Sean's hand was still bleeding profusely. In the waiting room, the blood ran down his palm, through the cloth and dripped onto the floor. While a more absorbent cloth was applied, I got my first peak at the damage. It was bad- worse than I imagined. There was no doubt Sean would need stitches. He joked," Are you sure you don't want to just stitch me up so we can get back to work?" "Well, we came all this way, we might as well let the doctors have a go at it." I replied. "Oh, that's a good picture! Stay still." The triage nurse did not know what to make of us. Obviously Sean was injured, but he was joking and laughing in between wincing in pain. And, I was taking pictures of everything. What a pair of loons she must have thought us! The staff was wonderful. Professional. Competent. Compassionate. Sean was numbed, debrided, stitched and released within a couple hours of arrival. 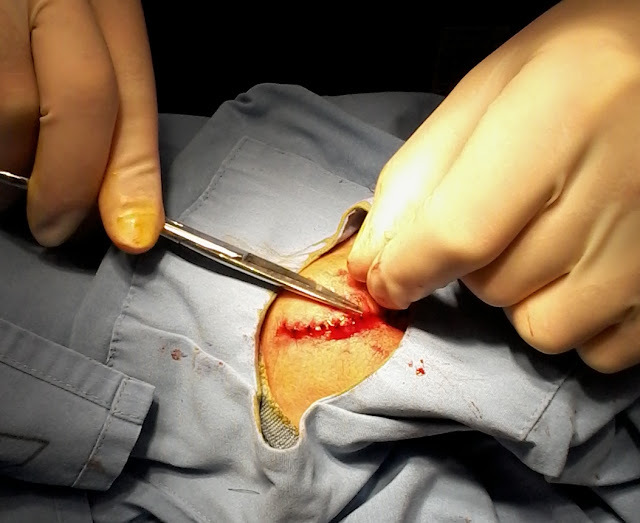 12 stitches: two inside to close around the muscle and ten outside to close the skin and keep everything in place where it belongs. Sean should not suffer any permanent damage, but he won't be doing much in the way of work this week- if he'll listen to me. Debriding the wound, even numbed made Sean wince and jump. A lovely row of neat stitches. Final product. Everything back inside where it should be. The unexpected trip put us behind schedule on the list of things we needed to do today. Things like, making soap and cheese, mailing packages, washing the laundry, replacing Kristen's bedroom door and deep cleaning the chicken coop. While we were gone, the girls helped with straining the feta cheese and setting it to drain. They also kept the laundry going. Once we were back at home, Meaghan and Kristen pitched in to help us with the afternoon chores, while Sean looked on in frustration and carried water buckets and bales of hay with his good hand whenever I turned my back for an instant. Sean restrained from using his hand and chores completed, Sean walked Kristen through using a chisel and hammer to finish preparing her door to be hung and ate his lunch. I talked Meaghan through making garlic alfredo sauce for tonight's dinner. The list that needs attending is still long, but we'll get through it together. Milking goats in the morning should be interesting! I had planned on writing to you tonight about other happenings around the homestead. I'll try to make some time to finish those posts as soon as I can. In the meantime, thanks for visiting with us tonight, Friends. As always, we are sure glad you are here.